VA 44 #1: Appeared in August 1928 (CTB), replacing VA 201 from US 60/VA 10/VA 20 (now US 360-460 Bus) Burkeville south via Victoria and Lunenburg to Chase City. Then VA 44 continued as new primary routing southwest to Clarksville (using a brief duplex with US 15/VA 32, then west as more new primary routing to end at VA 18 (now US 501) South Boston. In 1930, VA 44 was moved from today's SR 701/688/VA 92 via Skipwith to instead follow VA 49's direct corridor to Chase City. 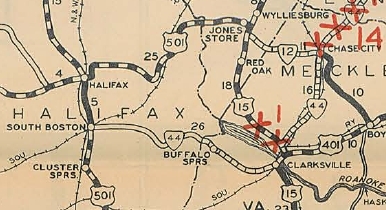 Also in 1930, VA 44 was removed from SR 601 and SR 732 in eastern Halifax County. 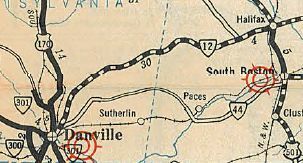 In Dec 1930 (CTB), VA 44 was extended west as new primary routing 10.16 miles towards Danville. Also, a second piece of VA 44 was born as new primary routing running from VA 12 (now VA 360) Danville east 6,45 miles. In June 1931 (CTB), the Danville piece was extended east 0.5 miles and the main piece was extended west 3.4 miles. In 1932, US 58 was assigned to VA 44 from Danville to Clarksville. 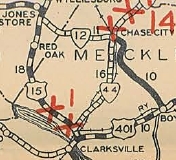 Sometime in 1932, VA 44 was placed on today's US 58 routing (new construction), leaving behind SR 732, SR 729 through Kentuck and SR 658 from Paces to Turbeville. Also about 1932, VA 44 was removed from SR 727/677 in Rehoboth and also SR 675/676 approaching Lunenburg CH. In July 1932 (CTB), the two pieces of VA 44 were joined in the primary system. In July 1933, VA 44 was dropped from US 58 and renumbered as VA 49 from Clarksville to Burkeville. VA 44 #2: Appeared in July 1933 as a renumbering of VA 419 from VA 49 (now US 522) Jefferson east to VA 147 Robius. 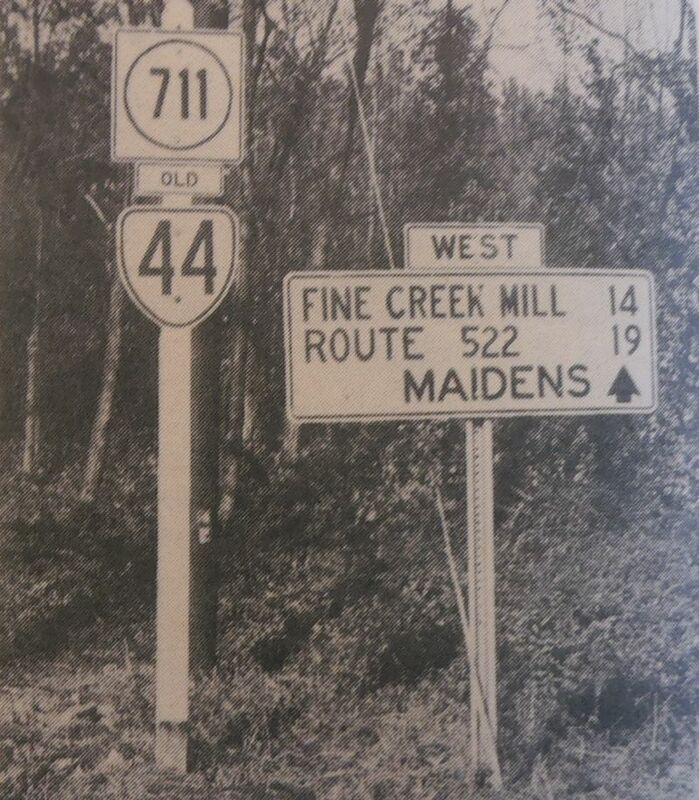 In Oct 1940 (CTB), VA 44 was removed from the SR 641 loop at Fine Creek. In May 1952 (CTB), VA 44 was downgraded to SR 711. Today some of SR 711 has rebuillt between VA 288 and VA 147 - VA 44 used Twin Team Ln, Powderham Ln, and Grey Oaks Ln. Most of this route still has a primary feel to it and could be viable for reinstatement someday. VA 44 #3: The earliest explicit CTB reference to the Norfolk-Virginia Beach Toll Rd was July 1962 and VA 44 was first mentioned in the July 1963 CTB. VA 44 was shown but not labeled as under construction starting with the 1967 Official. It was first explicitly labeled on the 1969 official, open from I-64/264 to Park Ave near the Virginia Beach Oceanfront. Although 21st and 22nd Streets were made into one-way roads to connect VA 44 to US 60 Pacific Ave, these were never made part of VA 44. The CTB deferred action to June 1996 whereby they elected to defer again. There was no further mention of anything related to this until they renumbered VA 44 as I-264 in Aug 1997. In Aug 1997 (CTB), VA 44 was transferred to the Interstate System as an extension of I-264 pending AASHTO approval. About 2000, I-264 was actually added to VA 44 and by 2001 VA 44 was decommissioned. The toll was 25 cents (booth between Independence and Rosemont), with 10 cents on ramps. Tolls were dropped in the mid-90s. VA 44 was posted with reassurance oversized cutout shields from Rosemont Rd eastward. There were also white border shields as late as 1993 along VA 165.